Sid Waddell’s magnificent commentary still raises a smile, and sparks great memories of a true sporting character, Jocky Wilson. Waddell hailed him as a working class hero – and a darts legend. As a labourer he built houses across Kirkcaldy, he worked as a miner, and he hustled with a set of arrows in his hand. For all the negatives life threw at him – a background and upbringing beyond challenging, the fags, the booze, and chronic ill health - one thing the wee man could do was throw a dart better better than anyone. He went from a council house in Kirkcaldy to world champ and back again, before closing his front door and disappearing from view. When he died in 2012, everyone assumed he must have been in his late 70s or early 80s as he hadn’t been seen for so long. He was just 62 years of age. He declined almost every request for an interview, politely rejected every invitation to celebrate landmark anniversaries, never sold his story, and, like Jim Baxter – Fife’s other great working class sporting hero, and fellow ex-miner – never sought pity. He simply left the stage. His legacy may belong to another era, but it is a important one that has to be recognised because Jocky is integral to the story of darts, and to Kirkcaldy’s social history. 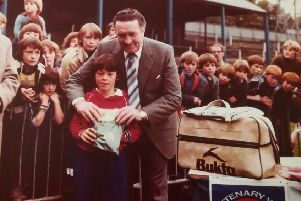 As a player he won two world titles and a place in at least the quarter-finals every year from 1979 to 1991 – a remarkable level of consistency – claimed four British championships, played in several World Cups, and won the very first Unipart Professional Darts Championship which carried the sport’s highest ever purse. The road from the Lister Bar - now demolished without so much as a nod to its remarkable place in British sporting history - to the world stage was packed with incident and controversy, and has sparked many stories, most of them true. Bobby George, his great friend from darts’ golden era, once told of Jocky turning up in America on tour with a suitcase which contained just one pair of socks. His explanation was simple – it looks better when checking into a hotel if you are carrying a case! True or not, it’s another classic Jocky story – but one that also diverts you from his remarkable rise from the toughest of beginnings. Jocky grew up in an orphanage because his parents were judged unfit to look after him. He went into the army from 1966 to 1968 before working as a miner and a chef at Seafield Colliery where he met Malvina, his wife. With three children - John, Willie and Anne-Marie– money was incredibly tight. Darts proved to be his road out. He honed his skills in the town’s thriving darts scene. Every pub had a team back then, with games played across the week. They packed into pubs and social clubs, and silverware was fiercely contested. They say Jocky wasn’t the best player, but he was the one who got the break. He was still a member of the Lister Bar team when he turned pro at the start of the 80s, but, by then, the stages were much bigger. BBC took the sport out of pubs and into millions of homes, and Jocky was among its first superstars – the wee man from Fife with nae teeth quickly made an impact. He went into the 1982 world championship as British champion, and emerged after eight days in the smoke-filled Jollee Nite Club, Stoke, as world champ. The first Scotsman to ever lift the trophy. Naturally he brought it straight back to the Lister Bar, driving through the night to get back home. While some sportsmen would build a trophy cabinet to show off their silverware, Jocky gave his to go on display at Dysart Social and Recreation Club where he threw his first darts. Fame and fortune beckoned – he was surely the first sportsman from these parts to have a computer game named after him by the then fledgling industry – but his roots remained firmly in Kirkcaldy. He won sponsorship from brands such as 100 Pipers Scotch whisky, saw the manufacture of darts flights bearing his name, but the money poured in and it poured out as he was ripped off more than once. So, he did what he did best. He picked up his arrows and hustled, taking on anyone at the oche, winning big money, and then losing it all. He was declared bankrupt, and ended up living on disability allowance. And when it all became too much, he headed back to the place he knew best. Kirkcaldy. His last interview came in 2007 when he spoke on his doorstep to journalist, Mike Wade. One more time, Jocky closed the door, and, by the time of his death in 2012 he was long forgotten by many, except those on the darts circuit who continued to honour his memory with competitions bearing his name. Or maybe they – we – didn’t forget his remarkable achievements, and the pioneering role he played in the sport. His death was recorded with an obituary in The Times. Not bad for a boy from the Lister Bar.